The court tomb at Loughmacrory is marked on the map as "Long Cairn" I was not able to gain access to the field where the tomb is situated but fortunately I was able to take these images from the road. 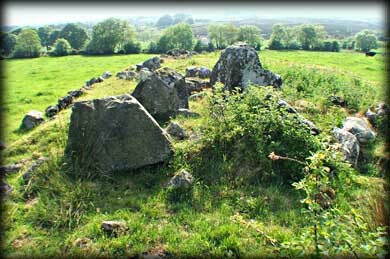 Obviously from the images the cairn and its kerb still remain and the cairn is approximately 25 metres long, it appears as though the court has been destroyed, but there may be subsidiary chambers at the south west of the cairn. 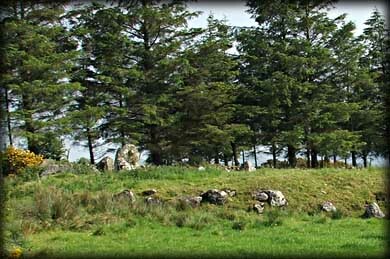 Situated: In the townland of Loughmacrory, from the wedge tomb travel 600 metres south, the tomb is in a field to your right just after the barn. Discoverer Map 13: H 5848 7701. Last visit June 2006.